INTERESTING BITS: Kenzie Culver’s 53:14 Music Video Experiment Done! Hello friends! I am so excited to show you my latest music video for my song, “Afraid of Being Saved”! This video was created for the 53:14 Music Video Experiment, produced by NoCoast Artists and CreatePlaces and was made possible thanks to support from Muse, a responsive, competitive grant program offered by Bohemian Foundation that provides support to organizations that have music as their primary focus, or that have a music-centered program. I am beyond thankful for this opportunity! I hope you enjoy the concept and that you can see how anxiety and lies we believe about ourselves can be crippling. If you like the video, the best way to show support is to share it on Facebook. Alt-pop-rock singer/songwriter Kenzie Culver backs up her dynamic stage presence with a voice of startling power, range, and expression. With a sound that’s youthful with an aggressive edge, her music rides an emotional range from ethereal to audacious. Her provocative lyrics, infectious hooks, and driving rhythms borrow attitude from punk but are grounded in earnest emotion. Recorded and produced with an L.A.-based indie label, Kenzie’s 2016 solo EP, Echoes, is the result of a Denver talent search in which she was chosen from hundreds of competitors. Her enthusiastic online following has resulted in thousands of YouTube views on her first single, “Are You with Me.” The track is an anthem for a generation on the rise and for those, like her, who have struggled with serious health issues. “I’m a firm believer that music heals the soul,” Kenzie says. She has opened for national acts, including Blue October, Parachute, TONIC and Night Riots. Kenzie’s recent track, “Afraid of Being Saved,” earned her semifinalist status in the 2017 Unsigned Only Music Competition, International Songwriting Competition and Music City Song Star. 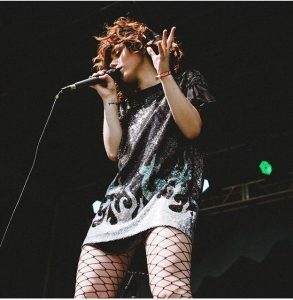 She has played prominent venues/festivals throughout Colorado, including the famed Mishawaka Amphitheatre, Ryan Seacrest’s Denver Seacrest Studio, NewWestFest and The UMS. Kenzie Culver enjoys frequent airplay and media coverage in Colorado, including her first magazine cover featured in NoCo’s Scene Magazine.